Cloudfone Lite Senior (Bar) and Cloudfone Lite Senior (Flip) phones deliver the awesome promise of peace of mind during times of emergency. Countless times people would talk about stress, traffic rush, and all-day hassle around the metro. The nature of the recent safety issues is at the very least shocking especially if the ones close and dearest to us are concerned. At times, when an emergency threatens life and limb, it's critical that assistance be extended to the victim as swiftly as possible. No wonder, one of the things people long for in life is to have peace of mind. Peace of mind is knowing that your loved ones are safe. Peace of mind is knowing that the people we hold dearly in our hearts are always within reach. Now, peace of mind can be in a button. 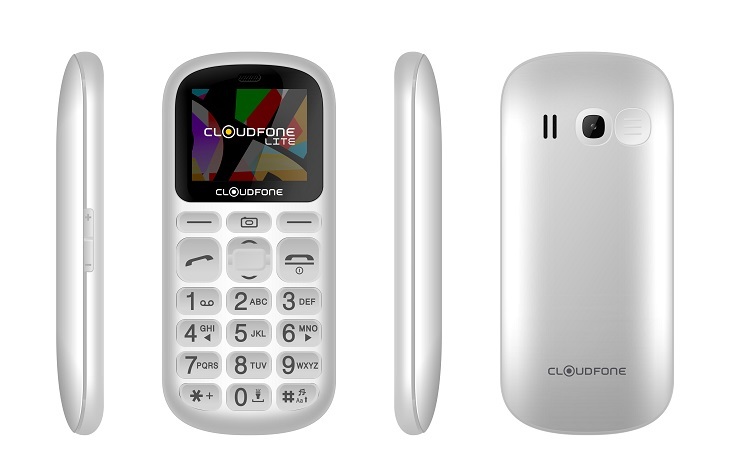 It is this fact that local mobile phone manufacturer Cloudfone recognizes as it launches its Cloudfone Lite Senior phones with S.O.S. Button. Recently, Cloudfone, the mobile and tablet brand of the Cellprime Group announced the availability of the Cloudfone Lite Senior (Bar) and Cloudfone Lite Senior (Flip) in all trade channels at PHP799 and PHP1,299 respectively. The newest devices to join the Cloudfone line delivers contents and features suitable for the older users aged 60 and above. As part of the CSR Give-Back Project of Cloudfone, 20 senior patients from the Martinez Memorial Hospital in Caloocan City were recently treated to free Lite Senior phones during the Cloudfone Peace of Mind Activity on the hospital grounds. During the event, CellPrime executives demonstrated how the ingenious S.O.S. Button in these new phones can help people seek help during medical emergencies and times of distress. As part of the CSR Give-Back Project of Cloudfone, 20 senior patients from the Martinez Memorial Hospital in Caloocan City were recently treated to free Lite Senior phones during the Cloudfone Peace of Mind Activity on the hospital grounds. Available in bar and flip versions, Cloudfone’s newest feature phones have an S.O.S. Button that automatically activates an alarm, sends emergency text messages and calls up to five (5) different emergency contacts with just one press. In the event of an emergency, a user simply presses on the S.O.S. Button on the Lite Senior. This first sends out a customized “cry for help” SMS message to the five emergency contacts. The button is placed in front of the flip variant and at the back for the bar variant. Once button is triggered, it will start making a loud alarm sound to signal that there’s an emergency. 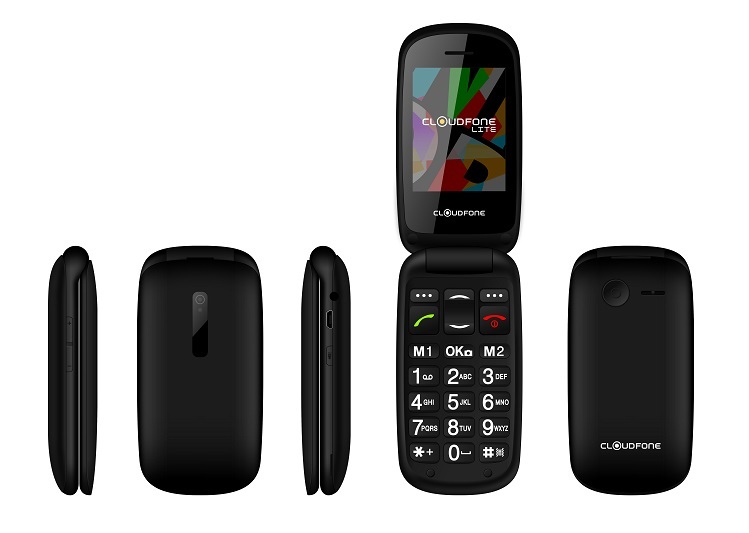 After which, the Cloudfone Lite Senior will start making emergency calls and texts continuously, switching one registered contact number to the next registered contact number just in case the first person failed to receive the call. It won’t stop alerting the pre-selected contacts unless the receiver answered the call. “This is a very simple device that our elderly loved ones, people who are close to our hearts, can appreciate in times of emergency as well as for everyday use, with big fonts and screen display, and large buttons in its keypad. Although we had our seniors in mind when we were developing this, we can also see how this could help with children of school age and other members of the family who can also have peace of mind by having this phone,” said Alcantara. Martinez Memorial Hospital’s COO Dr. Elizabeth Martinez Del Rio shared her excitement with the rest of the Cloudfone Lite Senior recipients. “When Cloudfone explained to me the features, I liked it. I explained to the recipients about the advantages in cases of accidents and distress. Ang galing. If I had that kind of phone when I had an accident, this phone could have helped. Maganda ito,” declared Dr. Martinez Del Rio. A few recipients have already responded well to their new phones. 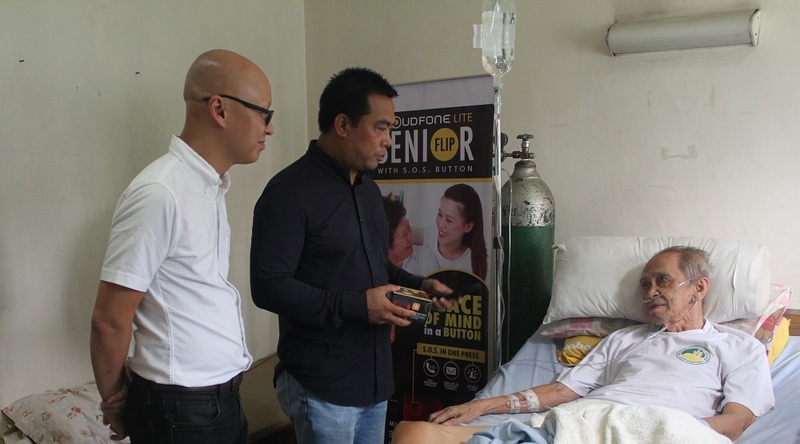 68-year old Cornelio Estrada, hospitalized for experiencing chest pains, has already planned to put in the contact numbers of his children and grandchildren in his new Cloudfone Lite Senior for future emergencies. Mrs. Dominga Martin, 71, recalled her difficulty in getting help when she accidentally slipped while at home. She also mentioned an instance when she was trying to ask for help when she was held up and robbed of her money during a trip in the city. She expressed her gratitude and happiness in receiving the phone. Cloudfone Lite Senior was diligently developed within a span of one and a half years before its launch in the country last June. CellPrime, makers of Cloudfone, took into account how they could take available technologies to make something awesome for seniors. “Here in the Philippines, a feature phone like the Cloudfone Lite Senior is a volume driver, meaning many people still look for this kind of phone. For every niche market, we want to develop something awesome for the Filipino customer and we make sure that the development of each feature in every phone is given enough time and thought, so we can reach that goal to be awesome. For the senior segment, we believe that the S.O.S. button is awesome because it serves as a lifeline to your family and loved ones,” expounded Ray Caguin, Cloudfone Group Brand Manager. The Cloudfone brand aims to continue giving awesome things to people that they normally wouldn’t be able to enjoy. The company is steadfast in its commitment to the Cloudfone promise of providing better, quality, and awesome devices that Filipinos can afford. “The one thing we do is we look for the Filipino customers 'pain' and then find a way to take away that pain by offering them what they want and what is awesome. For smartphones, we have already started offering great selfie phones at affordable price points. As we always say, quality does not have to be too expensive. And then we will also continue to develop other products that will give awesome to the people, and if there are other things like this that we can involve ourselves with, then we go straight ahead,” concluded Cloudfone Chief Marketing Officer Joey Oreta. Ray Caguin, Cloudfone Group Brand Manager, explains how the S.O.S. Button works during emergencies.